Sometimes it is necessary to be able to zoom in on electronic documents for easier viewing. This is especially helpful for those who are visually impaired. 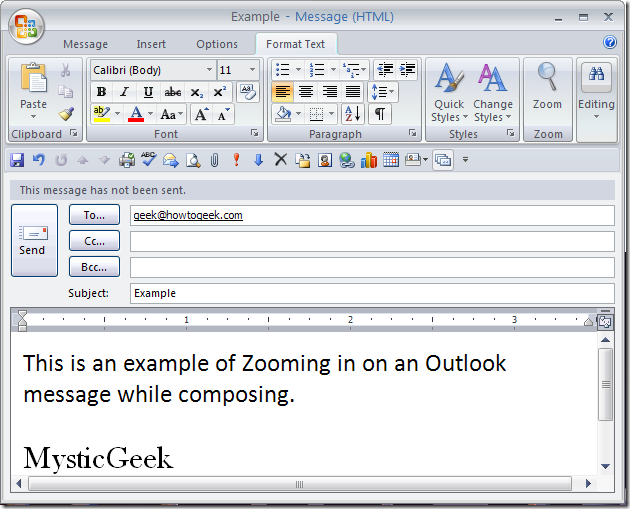 Like in most PDF viewers Outlook 2007 also has a zoom feature for reading and composing your emails. Open Outlook and start a new mail message. Make sure the cursor is in the body of the email so you can access the Format Text tab. From there click on the Zoom button. 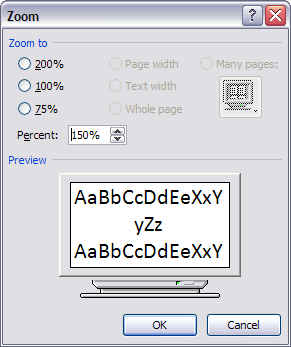 This opens the Zoom dialog box where you can choose the percent of increase the size of the text. As you can see above there is a preview window, but the best way to judge the size is to use it in an actual message. The easiest way I have found to zoom in on email while your reading them is to add the zoom icon to the Quick Access Toolbar and follow the steps above.